Acclaimed outdoor writer Pat Robertson talks to long-time pro angler Davy Hite about his career and plans for the future. When the live television camera zooms in on a professional angler playing a big bass and catches the utter frustration on the angler's face when the fish suddenly swirls and throws the hook, the color analyst sitting in the Bassmaster Live booth in Little Rock, Arkansas, describes in intimate detail the agony the angler is going through. That's because Davy Hite has been there and done that. Hite spent nearly two dozen years as a professional angler, and he has experienced all the lows - and all the highs - that are a part of trying to win a bass tournament. The former professional angler from Ninety Six has basked in the glory of winning on the world's largest fishing stages - and he has felt the depths of despair more than once when he saw a tournament win and even a Bassmaster Classic championship swim away. "I have won some tournaments and finished very bad in some tournaments and done everything in between," said Hite who gave up his professional angling career to step into the broadcast booth and provide expert commentary on live television during major B.A.S.S. tournaments. After twenty-three years fishing from coast to coast as a professional fisherman and having already passed the age of fifty, Hite was beginning to think about moving on from the grind of a tournament angler's life when the broadcast role practically fell into his lap at the end of the 2016 Bassmaster Elite Series. "I had known for a while that I did not want to be a guy who was still traveling across the country, fishing the Elite Series into my sixties and even my seventies like a few folks have done," Hite said. "I wanted to do a transition to the next stage, but having fished for a living for over two decades, what do you transition to?" Jerry McKinnis, one of the principal owners of Bass Anglers Sportsman Society (B.A.S.S.) and a pioneer in outdoor television programming, had the answer to that question. McKinnis tapped Hite as a full-time addition to the B.A.S.S. broadcast team, working as color commentator for "Bassmaster LIVE," "The Bassmasters" television show on ESPN2 and all other B.A.S.S. programming. The move was a natural step for Hite. During the last three years of his professional angling career, he had worked increasingly with "Bassmaster LIVE" hosts Tommy Sanders and Mark Zona and Elite Series emcee Dave Mercer. "On the final day of each Elite event and at the Classic, I would interview the top couple of anglers right when they came to the dock, and it ran live on the Bassmaster website," Hite said. "There is a tremendous following on the website the final day, so it was a good opportunity for me to have guaranteed coverage at every event." "I've known for a long time that Davy would be a great on-air talent," said McKinnis, who praised Hite's work on the "First Look" segments of Bassmaster.com tournament coverage. "I realized very quickly how comfortable Davy was in doing this. He's good at asking the right questions. But it's not an interview with him, it's more like a conversation, and that's important." With his stellar professional fishing history, Hite's addition to the broadcast crew provides a high level of credibility to the shows. Hite, 52, won more than $2 million in his 23-year career, which includes the Fishing League Wordwide Tour's Forrest Wood Cup title in 1998, in addition to the 1999 Bassmaster Classic crown and B.A.S.S. Angler of the Year titles in 1997 and 2002. His B.A.S.S. career includes eight first-place finishes, 14 Bassmaster Classic appearances and 45 Top ten finishes. He finished in the money 140 times in 254 total tournaments. The life of a pro angler is not an easy one. They travel thousands of miles a year, pulling their bass boat behind them, often go without much sleep and rest, moving from lake to lake and fishing in all kinds of conditions from blazing sun to pouring rain and even in a snow storm. Those scenarios describe not only the days they are on the water practicing, but when they return to the lakes or other waterbodies for the actual tournament. On top of that is the pressure to win because winning guarantees sponsorships, and the win money helps pay the bills. But winning also means more travel for personal appearances and to conduct seminars and work on product development for the sponsors. Fans are not the only ones excited to see a Bassmaster Classic or Forrest Wood Cup scheduled for their area. Hotels, restaurants and other businesses get a big boost when the fishermen come to town. Information provided by B.A.S.S. 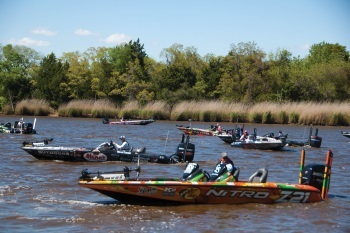 indicates that host cities for previous Bassmaster Classics reported economic impacts between $23 million and $26 million, with more than 11,000 total room nights booked. Similar impacts could be expected for the Forrest Wood Cup. And it's not just the championships that bring a flood of money with the anglers. Cities that have hosted Elite Series tournaments report an economic impact of up to $2.6 million, with more than 2,000 hotel rooms booked. Much of that is behind Hite now. The pressure to win is gone, along with the heavy travel and the physical demands of long hours on the road and on the water in all kinds of conditions. "Right now I am doing all the Elite tournaments, the Bassmaster Classic and the Angler of the Year Championship, about a dozen tournaments in all. Ten of the twelve are in the studio and two are on site where I am on the water with the competitors." 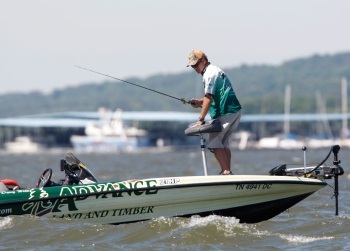 Typically, on a tournament week, Hite said, he flies to Little Rock on the first day of competition to prepare for "Bassmaster LIVE," which starts the second day of the tournament. "We do six hours of programming each on the second, third and fourth days of the tournament, and then I fly back home right after the tournament is over," he said. "It is a way for me to continue to have a positive impact and stay involved with the sport of bass fishing, which has meant everything to me." Those six hours of live programming each day are exciting, he said, because six cameras are covering action on the water the entire time. The concept has served to boost the sport of bass fishing, bringing the fishing action right into the viewer's television set - or his laptop, tablet or smart phone. "The thing that has held fishing back is that it is not a spectator sport because you can't have all the competitors on a one-hundred-yard field like a football game." But those six cameras following competitors from the early morning launch to the afternoon weigh-in capture a lot of the action during a tournament, and Hite is the voice behind the lens explaining, not only what is going on, but what the angler is feeling, much like the color commentator during a game broadcast. "It's humbling to me to know I am being the analyst on a show that more people are watching than there are in Williams Brice Stadium on a football Saturday," Hite said, noting that Saturdays often provide the ultimate in bass tournament coverage. "We actually have guys watching ‘Bassmaster LIVE' on their iPhones while they are fishing in local tournaments." The pros tip their caps to the training grounds and competitive waters in our backyard. 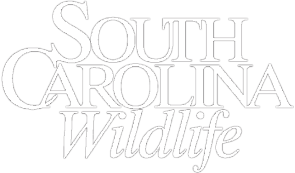 Although relatively small in geography and population, South Carolina has been in the forefront of the bass tournament explosion during the past half-century that has captivated recreational fishermen in the United States and beyond. 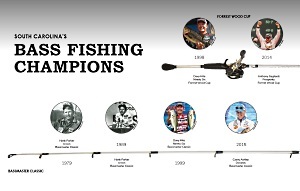 Palmetto State anglers have won four Bassmaster Classic titles and two Forrest Wood Cup championships. The state itself has hosted four Bassmaster Classics, with a fifth scheduled for March 16-18, 2018, on Lake Hartwell, plus three Forrest Wood Cups, the most recent held in August on Lake Murray. The state's lakes and waterways are not only attractive to B.A.S.S. and FLW Fishing as venues for regular-season qualifying tournaments and championships, the champions from South Carolina all agree that they are also the ultimate training grounds for aspiring professional anglers. And, they also agree that the fame they have gained as top fishermen has provided a conduit to promote the state's fishing opportunities and attract tourism. "The first time I fished at Santee Cooper I could not believe it," said Hank Parker, two-time Classic Champion who grew up in Maiden, North Carolina, but now lives on a farm in Union County. "I was fifteen years old and it looked like there was a fish behind every tree - and it seemed like there really was." Parker, now the host of "Hank Parker's Outdoor Magazine" on the Outdoor Channel and "On the Water with Hank Parker" on the Pursuit Channel, was a resident of Clover when he won his first Bassmaster Classic title in 1979 on Lake Texoma in Texas. He had moved back to North Carolina when he won his second title on the James River at Richmond, Virginia, in 1989, but the diversity of fishing and hunting lured him back to South Carolina. "Growing up my favorite lake was Lake Wylie, but Santee Cooper helped me develop my fishing skills more than any other place. I had to learn to read the water, how to fish current and fish in the grass, how to get a big bass from under a cypress tree or a stump without breaking the line." Davy Hite, who won the 1999 Bass-master Classic on the Louisiana Delta and captured one of the first Forrest Wood Cup titles the year before on the Mississippi River at Moline, Illinois, credited the versatility he developed fishing South Carolina waters for winning those championships in such diverse surroundings. "South Carolina gave me the opportunity to be a well-rounded fisherman, fishing cypress trees at Santee Cooper, fishing aquatic vegetation at Lake Murray when I was growing up, fishing boat docks at Lake Wateree, learning to fish the contour, depth change and standing timber in Lake Hartwell and the standing timber in Clarks Hill," said Hite who grew up in Saluda and earned his early fishing stripes on Lake Murray. 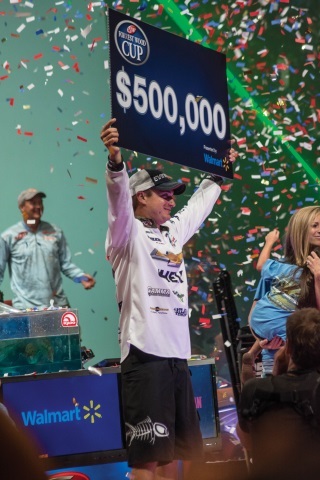 Casey Ashley, the 2015 Bassmaster Classic Champion on Lake Hartwell, grew up in the little town of Donalds in Abbeville County and honed his fishing skills on nearby lakes Russell and Clarks Hill (Thurmond). 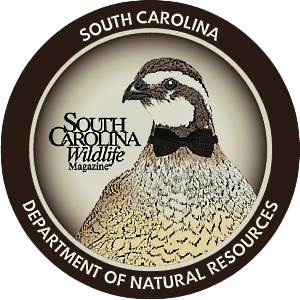 "People think of fishing in South Carolina and they think blueback herring, deepwater and topwater fishing, but our lakes are so diverse," said Ashley. "You can fish here to suit any style. Our lakes train you to be versatile." "South Carolina has a broad spectrum of fisheries with rivers, tidal waters and lakes," said Anthony Gagliardi of Prosperity, winner of the 2014 Forrest Wood Cup on Lake Murray. "We have a lot of different lakes just a three-hour-drive from one another that pretty much encompass everything we encounter on the FLW Tour." Although he grew up in the Upstate and fished Lake Wylie a lot, his family had a weekend house on Lake Murray and he spent his summers in high school and college on the lake learning different fishing techniques, said Gagliardi, who fished the FLW Tour's Red Man Trail as an amateur in high school then moved up to the FLW Tour itself as a co-angler while attending Clemson University. "That is when I was able to learn the things that have helped me in my fishing career," he said. "That time on Lake Murray is when I developed most of the skills that helped me at least through the early stages of my career." The diversity of South Carolina's waterways forces anglers to be versatile and that versatility is what propels them to the championship stage. 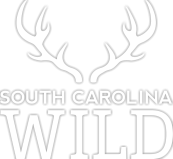 Outdoor writer Pat Robertson is a longtime contributor to South Carolina Wildlife. Ever thought about fishing in the big leagues? Check out this video of FLW pro angler Brandon Cobb for some insight.